With the holidays right around the corner I'm doing my best to whip things into shape for autumn. I have a mostly all-white pumpkin/natural theme going on in my dining room but in the family room/breakfast nook I've mixed it up a bit. I know this is a gardening blog, but I don't think ya'll mind when I share some of my crafting fun with you like I have for past holidays. This weekend our Florida weather was so wonderful it actually felt like fall. Along with some very enjoyable gardening time, I also decided to paint some pumpkins. 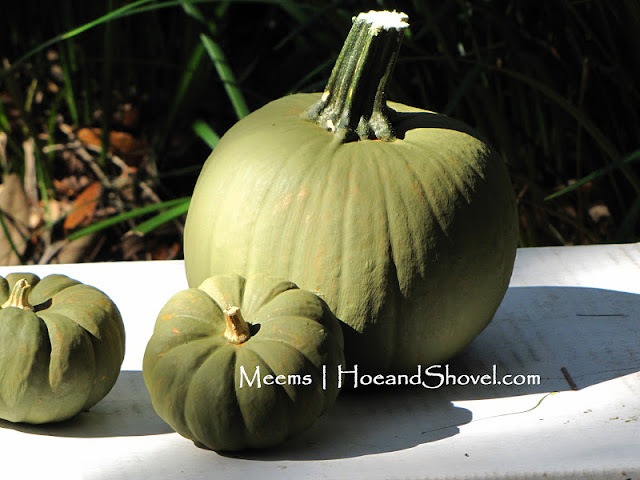 I usually purchase several heirloom pumpkins for decorating the front entry and the inside of my home. They have not been available in abundance this year and besides that, they are a bit pricey. 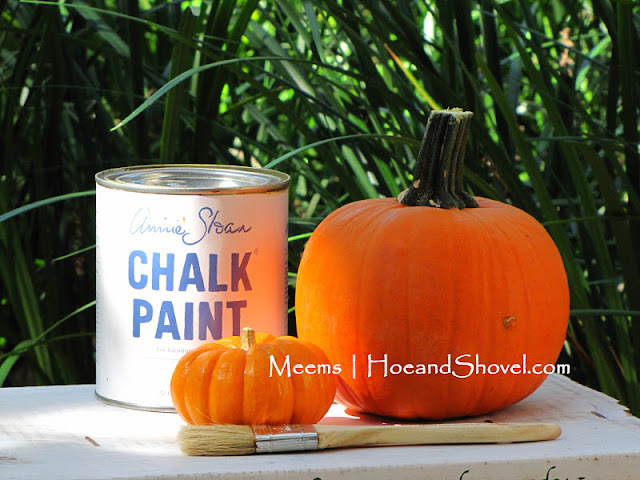 I used some Annie Sloan 'Olive' Chalk Paint that I already had on hand from a previous project. One coat covered the pumpkins well enough for my purposes. I let that dry for about 20 minutes. Then I rubbed off the olive paint with a damp towel (a piece of sandpaper would also work) distressing the pumpkins (much like we do with furniture) in random patterns. I was happy with the way they turned out. But then I decided to take it a step further and finish them with Annie Sloan Soft Wax. I rubbed on a thin coat of 'clear' wax with a clean rag. Before each one dried I also rubbed each pumpkin with a small amount of 'dark' wax. The dark wax gave me the exact look I was striving for. It added a patina that gives them a unique appearance. The entire project took me about 30 minutes. 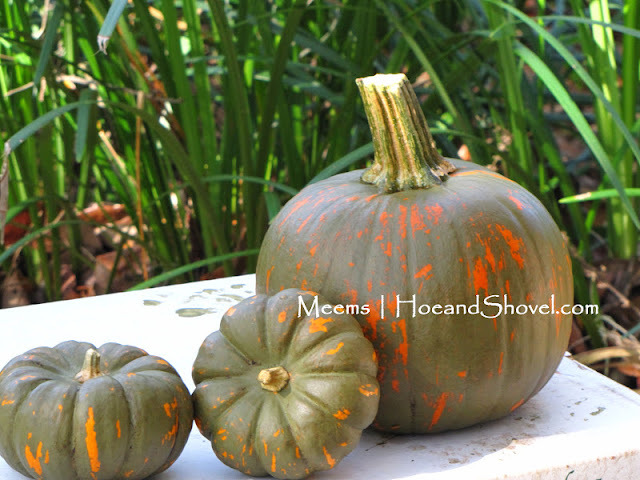 I realize these pumpkins don't exactly look like heirlooms but the coloration does resemble an heirloom, don't you think? ***Just so you know, I didn't come up with this idea. I saw it somewhere using white paint and kept the idea in the back of my mind. I wish I could remember where it was so I could give credit. They look wonderful! Job well done! They certainly do have the heirloom look you were seeking. They'll be beautiful in and outside your home! I think your pumpkins look like the real thing for a lot less money. 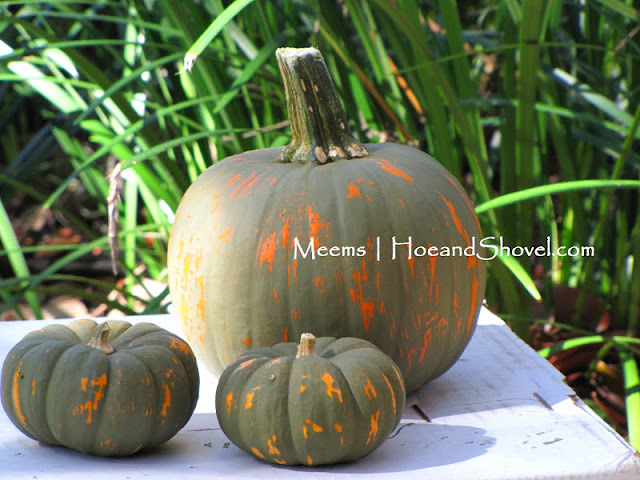 Meems, it's the sanding off part that really makes these pumpkins rock!